This genus is accepted, and is native to Asia-Tropical, Europe, Africa, Antarctic, Pacific, Southern America, Northern America, Australasia and Asia-Temperate..
Rhizome erect or creeping, with clathrate scales, vascular cylinders with large overlapping leaf gaps (dictyostelic). Stipe matt or glossy, black, chestnut brown or greyish-green, glabrous or with hairs, or with clathrate scales. Frond simple to 4pinnatifid, glabrous, pubescent or with scattered scales, veins pinnate or flabellate, free. Sori usually elongate, but about as long as broad in some species, borne on the costal side of a vein. Over 600 species, cosmopolitan. 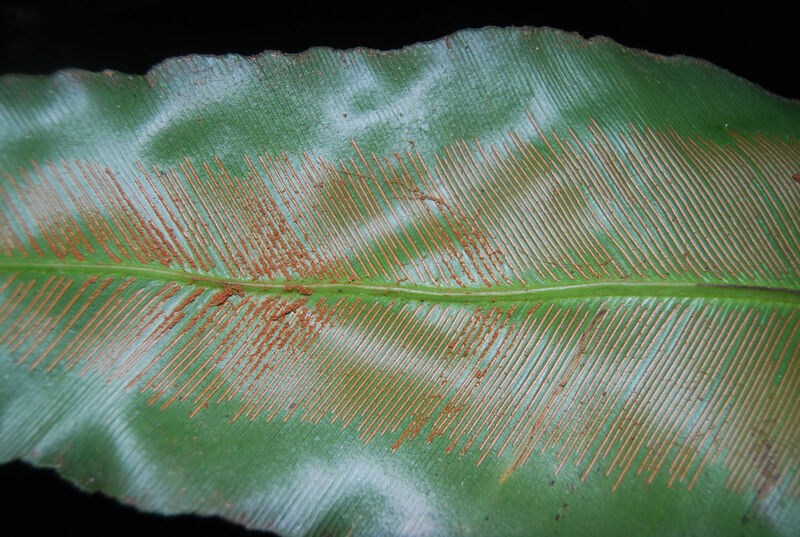 Both Christensen in Pteridophyta of Madagascar pp. 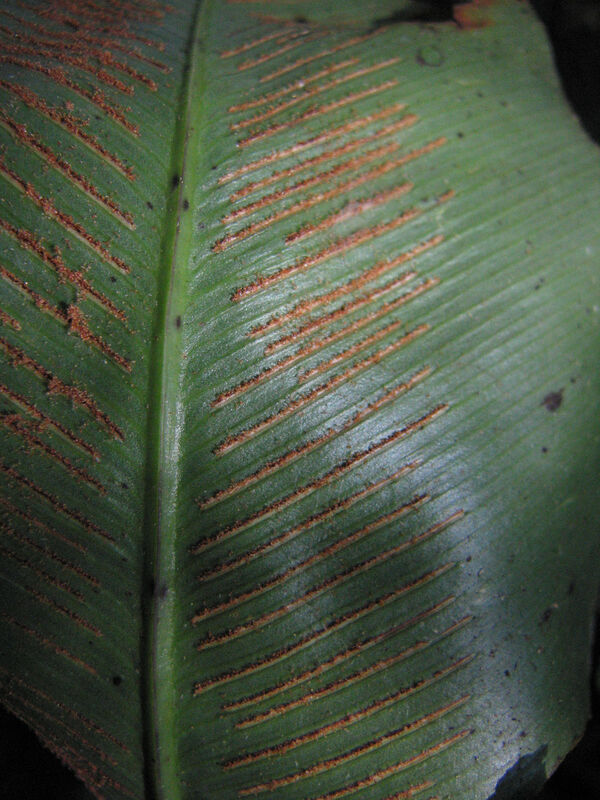 85–86 and Ballard in the protologue of A. paucijugum point out the astonishing degree of variation occurring in many of the species of Asplenium. Asplenium acuminatum Hook. & Arn. Asplenium alatum Humb. & Bonpl. ex Willd. Asplenium × aran-tohanum Alejandre & M.J.Escal. Asplenium ayopayense M.Kessler & A.R.Sm. Asplenium biafranum Alston & F.Ballard ex Ballard Hook. Asplenium bipartitum Bory ex Willd. Asplenium bolivianum M.Kessler & A.R.Sm. 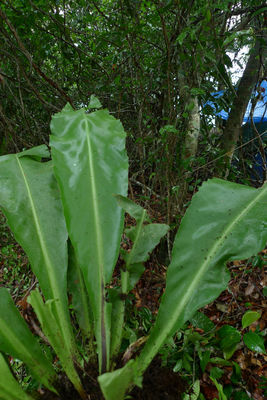 Asplenium castaneum Schltdl. & Cham. Asplenium × chasei Viane & Reichst. Asplenium cirrhatum Rich. ex Willd. Asplenium × contrei Calle, Lovis & Reichst. Asplenium × cyrnosardoum Rasback, Vida & Reichst. Asplenium douglasii Hook. & Grev. Asplenium fibrillosum Pringle & Davenp. 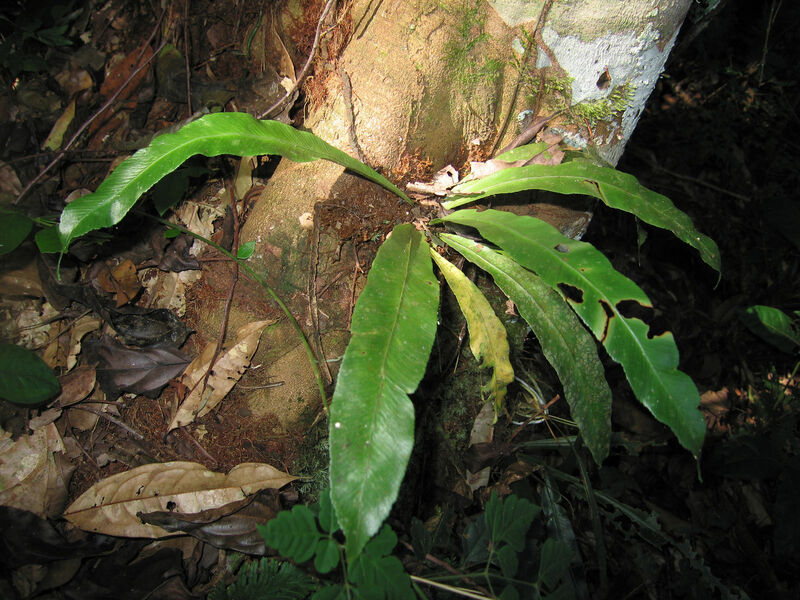 Asplenium guangdongense Y.Fen Chang & H.Schneid. Asplenium × herb-wagneri W.C.Taylor & Mohlenbr. Asplenium × hopei Viane & Reichst. Asplenium hymenophylloides Fée ex C.Chr. Asplenium × jacksonii (Alston) Lawal. Asplenium khullarii Reichst. & Rasbach ex Fraser-Jenk. Asplenium × kidoi Sleep ex Viane, Y.X.Lin & Reichst. Asplenium × krameri (Herrero, Prada, Pajarón & Pangua) Rivas Mart. Asplenium kukkonenii Viane & Reichst. Asplenium × lacei Viane & Reichst. Asplenium × lobmingense Lovis, Melzer & Reichst. Asplenium macraei Hook. & Grev. Asplenium mae Viane & Reichst. Asplenium × mickelii Viane & Reichst. 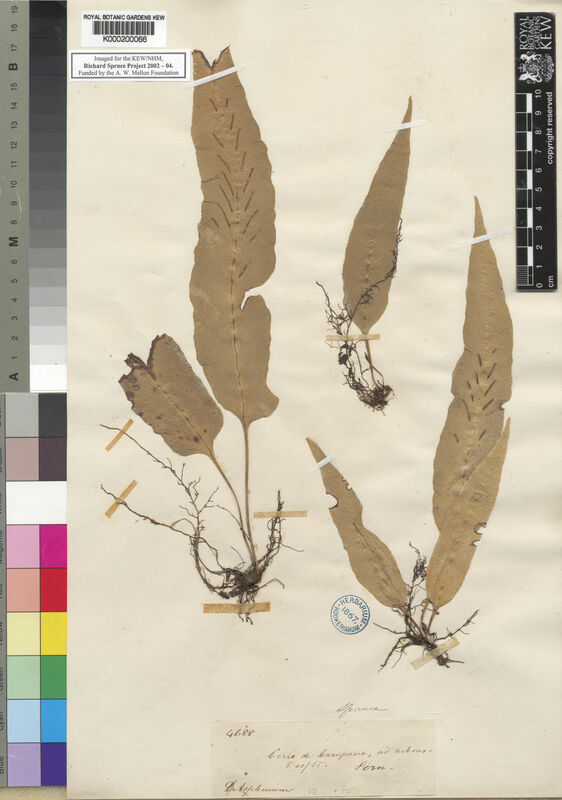 Asplenium micropaleatum M.Kessler & A.R.Sm. Asplenium × mitsutae Viane & Reichst. Asplenium nigripes (Fée ex T.Moore) Hook. Asplenium normaloides Y.Fen Chang & H.Schneid. Asplenium × orellii Lovis & Reichst. Asplenium platybasis Kunze ex Mett. Asplenium ponapeanum T.Nakam. & Miyam. Asplenium protractum Tardieu & C.Chr. Asplenium × ruscinonense Nieschalk, Lovis & Reichst. Asplenium rutshuruense Taton ex Pic.Serm. Asplenium sajanense Gudoschn. & Krasnob. Asplenium scolopendrioides J.Sm. ex Hook. Asplenium semivarians Viane & Reichst. 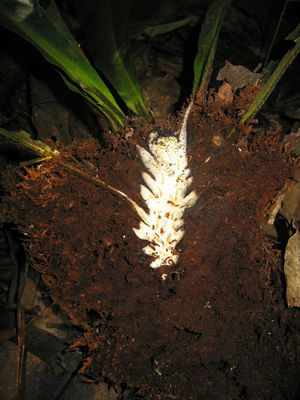 Asplenium setoi N.Murak. & Seriz. Asplenium × sollerense Lovis, Sleep & Reichst. Asplenium × suevicum Bertsch ex D.E.Mey. Asplenium tunquiniense M.Kessler & A.R.Sm. Asplenium tutwilerae B.R.Keener & L.J.Davenp. Asplenium wachaviense Asch. & Graebn. Asplenium × woynarianum Asch. & Graebn. Asplenium wrightii D.C.Eaton ex Hook.